Experience — for the traditional professional — includes your professional experience or work history presented in reverse chronological order (also known as RC) on your resume. This section is critical because it’s where you provide the proof to support your objective header, summary, and keyword sections. This is where the employer looks for these details, but this is also where you can easily lose that attention. Each position will have at minimum your specific job title, employer company name, location (city, state), and dates of employment. Account for each position in a way that shows progression and promotion within an organization whenever possible. For new graduates or those professionals making a serious transition, this section could encompass experience gained from volunteer work, internships, school projects and papers, personal studies, and a variety of nonpaid areas. The position overview or hook. This part is typically presented as a brief paragraph that sets the stage for the position by laying out the goal or challenge of the position. Proof-of-experience statements. This is typically presented as a series of bullets that follow the hook paragraph. The goal of these statements is to show that your experience matches that of your job target. Do not make the mistake of thinking of the parts of your experience from the point of view of “responsible for.” This phrase should never appear on your resume. Further, when you write about your responsibilities, position them to show you stand out from your similarly qualified competition by telling very brief stories that explain the challenges you faced, actions you took to deal with those challenges, and the results you attained (also called CAR stories). By using this CAR method, you direct prospective employers to the value you would bring to their companies. Your Core, one-size-fits-all resume that you will develop first, before beginning to target positions with your OnTarget resumes, is going to cover all the competencies (experiences) and related accomplishments you have for the job you performed. Under each job listed, your Core resume will have a seemingly long list of bullets that you can use to pick and choose from as you later tailor your OnTarget resumes to specific positions. As you write, turn continuously to how you impacted these power areas, even if you weren’t recognized for the contribution. If you made your life easier and your job more efficient, it counts! The snapshot of the resume below depicts a job description from a one-size-fits-all resume. Notice how the first paragraph hooks the reader with the challenge and the bullets cover all areas of key responsibilities while emphasizing CAR stories. 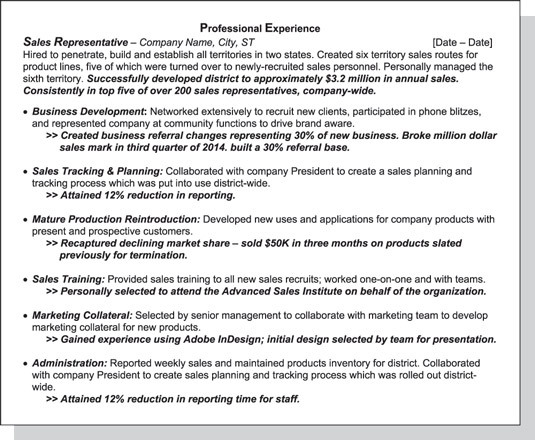 A succinct yet powerful listing of an applicant’s professional experience. Competencies are the behaviors required to do the work and are often hinted at more than listed. They don’t come in a handy-dandy, one-size-fits-all package. To meet the needs of applicant tracking systems (ATS), which seek to connect that you have all the right skills and competencies, you need to go a step further in your job bullets to show how your accomplishments confirm your competencies. Or to turn it around, you must show how your competencies enabled you to rack up home runs. If you’re aiming for a job with a large employer, bone up on competency policy at each company. You can call the company’s human resource department and ask, “Do you use a competencies model in recruiting?” If so, ask whether you can obtain a lexicon of the company’s core competencies and the role competencies for the target position. Sometimes, the HR specialist will reveal the competencies and sometimes not. But ask. If they won’t, you need to rely on the job description to make sure you know and position yourself for every requirement. Product development: Created new mid-market segment supporting an annual growth rate of 20 percent in a flat industry, demonstrating high energy and business acumen.